Need a Mechanic in Harolds Cross? Need Tyres in Harolds Cross? 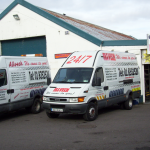 AllVech is ideally located for mobile mechanic services throughout Harolds Cross. Our fleet of mobile mechanics in Harolds Cross provide 24/7 Breakdown Assistance at the Roadside, Emergency Jump Starts, Mobile Tyre Fitting and Vehicle Recovery. Why go to a garage when we can come to your Home, Job or College! I had Shane from Allvech come out to my home in Harolds Cross and replace a battery the morning of my NCT test. Leaving to the last minute wasn’t clever, but needless to say it passed.